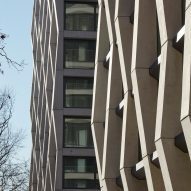 US studio Handel Architects has completed a pair of residential towers with concrete facade elements, designed to respect the proportions of a neighbouring stone cathedral. 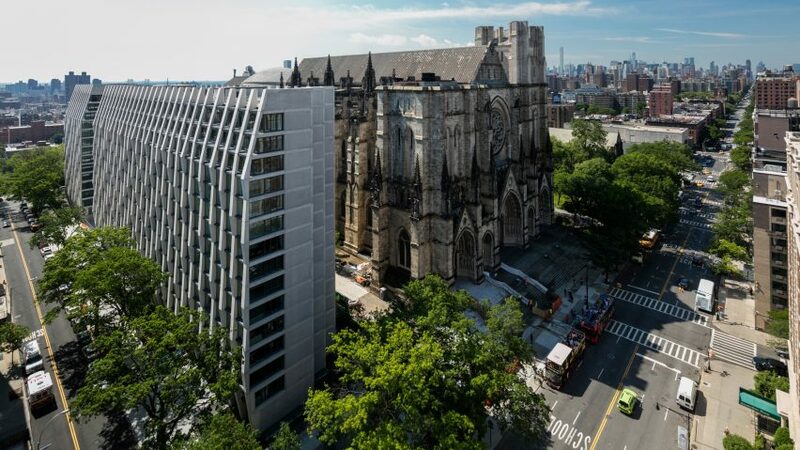 Called Enclave at the Cathedral, the project is located on the property of the historic Cathedral of St John the Divine in Upper Manhattan – one of the largest Christian churches in the world. The cathedral's interior measures 121,000 square feet (11,200 metres) and its height reaches 232 feet (71 metres). The new apartment building consists of two distinct volumes separated by a grand staircase, which leads to the cathedral's nave. The church — designed in Byzantine-Romanesque and Gothic styles – was initially conceived in 1888 by architects George Lewis Heins and Christopher Grant LaFarge. Construction began in 1892 and was never fully completed. The 15-storey housing block sits adjacent to the church, on the corner of West 113th Street and Amsterdam Avenue in the Morningside Heights district. The site formerly housed sheds where granite stones were cut and used in the church's construction. While conceiving the residential building, the design team was mindful of its prominent neighbour. "Given the proximity of the new building to the cathedral, the siting, massing and design were critical," said Handel Architects, a New York-based studio that also has offices in San Francisco and Hong Kong. The firm recently completed an apartment tower in New Jersey, designed with New York firm Hollwich Kushner. Setbacks on all sides provide space for landscaping and a continuous connection to the cathedral's campus. Stepped facades and a new plaza help ensure clear views to the church and a nearby park. "The carving of the building's corners and setbacks allows multiple interior views of the cathedral, as well as to Morningside Park to the northeast," the team explained. The exterior walls are made of concrete elements of varying sizes that evoke the cathedral's buttresses. 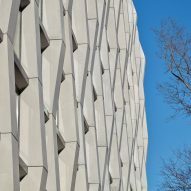 "The Enclave's facade is composed of a series of cast-in-place, structural concrete ribs, derived from the transformation of the cathedral's buttresses," the architects said. 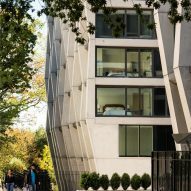 "The depth of the ribs varies along West 113th Street, creating an articulated facade that changes as one moves around the building." At the top of the building, the ribs taper and pull away from bands of glazing. As the ribs approach the ground, they taper inward, allowing for more landscaping around the base of the building. Inside, the towers contain 430 rental apartments. 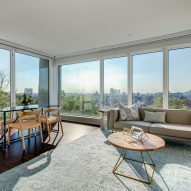 Floor-to-ceiling windows provide sweeping views of the cityscape. The towers are connected by an entrance lobby and gallery that were placed below the exterior staircase. Skylights bring natural light into the entry zones. Finishes inside the building reference the facades. "The building's interiors follow the material expression of the exterior," the team said. 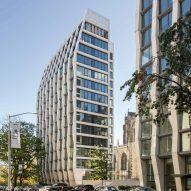 The Enclave at the Cathedral of St John the Divine by Brodsky joins a number of new, major residential projects in Manhattan, including a tower by David Chipperfield that is now under construction and a condo building by the late Zaha Hadid. For job opportunities at Handel Architects, visit their company profile on Dezeen Jobs. Photography is by Bruce Damonte, David Paler and Pavel Bendov.